Nikken provide numerous options for manual machine based measurements and workpiece setting. Over the years we have become the pioneer for many solutions and devices to suit these precise applications. The Nikken height presetter is designed not only as a fast effective setting gauge for workpieces and tools alike but can also be used and an aid to measuring and adjusting boring systems or reamers e.t.c. As versatile on a lathe as it is on a machining centre the HP series effectively eliminates the need for test cutting and allows your operations to run smoothly directly after the initial setting. Our height presetters are available in three variants; Mechanical types HP100 & HP150 for any application along with the compact HP50K which relies on conductivity between the workpiece and tool being measured. Our Micro-Touch system enables instantaneous detection of a workpiece or component by means of a red lamp indicator and audible 'beep'. Originally the system relied on conduction (effectively the Micro_touch makes a circuit with a metallic component/part) however; this limitation has now been completely eliminated by the introduction of our new 'X' type version. 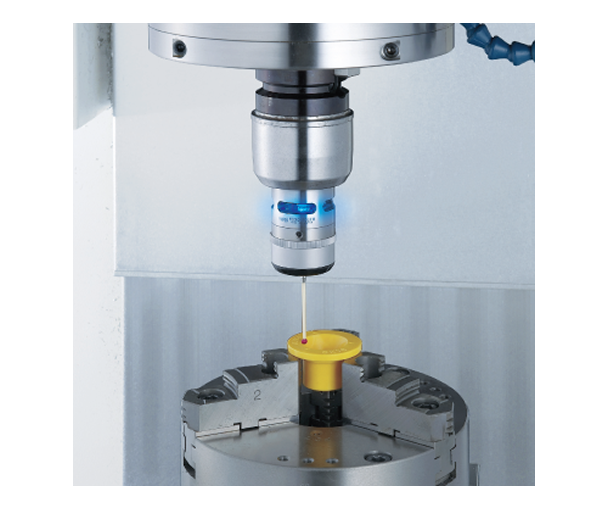 The UMTX adopts its own revolutionary 'internal contact system' which makes it ideal for non-conductive workpieces or applications. Operation is identical to the standard UMT without the restrictions or limitations of material or component. Our Micro stand is the ideal base to mount your dial test indicator for clocking or aligning you parts or equipment. The system features two arms which incorporate a ball joint mechanism at both ends of the assembly. This design effectively allows complete freedom of movement in any direction such as vertical, lateral, longitudinal or rotational. If the arm is outstretched horizontally it is capable of effectively reaching up to 300mm. Locking is provided by a simple hand wheel which instantly and effectively fixes the position of the arm. The ball joint system makes the Micro stand the quickest and easiest to use system on the market. Our Touch point sensor is a highly sensitive position sensor. Effectively the system is very simple to use and operates by lighting an indicator light the moment the contact ball is very slightly deflected from its housing. As with the UMT the system works by conduction so is only suitable for metallic contact applications. For information on any of our 'on machine' accessories please contact the Euro Centre.